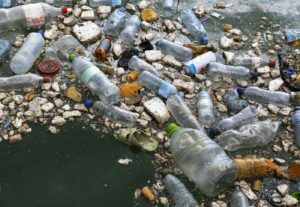 The average American throws out roughly 185 pounds of plastic each year, and 50% of that plastic gets thrown away after only a one use. It’s no surprise that we have a global environmental problem on our hands. In order to make a dent in this gigantic problem of waste, we need to change our habits, both at home and out in the world. Here are seven ditch-the-plastic habits you can start in your bathroom right away. Every plastic toothbrush you’ve ever used in your lifetime is sitting in a landfill—not breaking down. In fact, one billion toothbrushes are thrown away each year, and this hygiene habit produces no less 50 million pounds of waste every year. Quit buying plastic toothbrushes and get bamboo-handle brushes that come packaged in cardboard. Bamboo-handled brushes, when composted, can biodegrade in less than a year. Store-bought toothpaste comes in a plastic plastic tube and some include plastic microbeads for scrubbing. Kick this plastic habit (and save money too) by making your your own using water, baking soda, and peppermint oil or any other food-safe essential oil you like. In fact, there is no shortage of great homemade toothpaste recipes on the internet. Shampoo, conditioner, bodywash, and shower gel come in plastic bottles that almost always end up in a landfill. Switch to bar soaps that come in cardboard boxes, in paper, or without packaging at all, and you can even switch to bar shampoo—just make sure to go for one that is paraben-free, is gentle on skin, and free from animal testing. Traditional tampons come in plastic applicators and most pads and pantyliners come wrapped in plastic that ends up in landfills. Opt for cardboard-applicator tampons or applicator-free tampons or try a menstrual cup instead. Switch to toilet paper that comes wrapped in paper rather than plastic. Even better if you can find toilet paper made from recycled materials. Disposable plastic razors, like toothbrushes, are still out there in landfills right now, and even razors with replaceable blades generate plastic waste. Instead, opt for a safety razor with a stainless steel handle and metal-only blade replacements. Instead of using a plastic loofah—which gets thrown out every month or so—to exfoliate in the shower, switch to a bamboo-handled body brush (make sure the bristles are natural and non-plastic) or natural loofah for that scrubbing action. Matilda lives in Raleigh, North Carolina, where she writes about health and wellness. In her free time, she enjoys yoga, hiking, and walking her dogs.